Now is the perfect time to get your spring garlic planted. We use a lot of garlic here, and having fresh, organic garlic year round is important. So, each spring and fall, we plant it. Here’s how to get your Spring garlic planted for a fall harvest. First, you want to prepare the garlic cloves for planting. Break a Garlic bulb apart (the whole thing) and put the cloves inside a big mason jar with equal parts of baking soda and liquid seaweed (I opt for around 1 TB). Leave the cloves in the jar for at least 2 hours prior to planting. This is necessary as it does an amazing job at preventing bacterial and fungal growth! 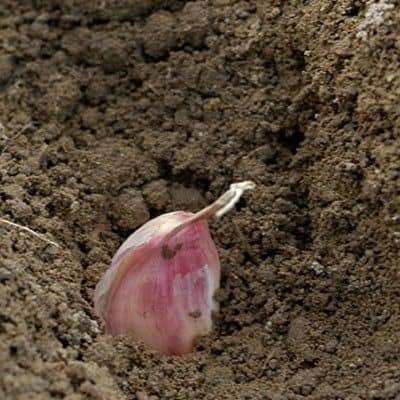 Garlic grows best in well drained soil — not sand! Make sure that your space is free of weeds and rocks, then dig 3-4″ down. Place the cloves into the spaces about 8″ apart. This will ensure that you do not have anything TOO close together! When placing the cloves in the soil be sure that the root end (flat part) is pointed DOWN and the other end UP! Then, you just keep it watered and you wait! After a couple of weeks, you’ll start to see green shoots coming out of the bed and you know that it’s growing! Once the shoots have dried up, then the garlic will be ready for harvesting. In the meantime, you can also cut some of green garlic chives and use them for seasoning in cooking, or fresh in salads. Yumm! Heather, I never plant garlic in the spring. Have you planted both in the fall and spring to see the difference. 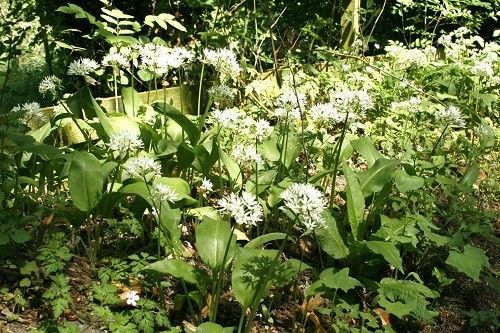 This year I might plant some in the spring to deter some voles. Yeah, what she said. I planted in the fall, too and will likely harvest in June or July. BUT … are you saying if I put some more in now, I can harvest again when? Like October? And get TWO rounds? Sweet! In that case, where ever I need garlic as a companion, I can just put in a new bulb. Huh … spring garlic. Whodda thunk? That is PERFECT, Heather! Thanks so much for this! I am on it … soon as the stupid weather breaks! COME ON SPRING! Thanks for the straight forward help. I’m going with this.